Favourites Newtonmore and Glenurquhart are both through to separate semi-finals of the RBS MacTavish Cup, the North area championship, following comfortable 3-0 home wins over Lochaber and Inverness. The semi-finals of the corresponding South contest for the Celtic Society Cup will comprise an Oban derby between Celtic and Camanachd and a repeat of the 2014 final between Inveraray and Kyles. In the Marine Harvest Premiership, Kingussie partly steadied the ship after a series of poor results with a 2-2 draw at home to Lovat, while Fort William lost 3-0 to Kinlochshiel at An Aird. The biggest score in the SSE Scottish Hydro Camanachd Cup preliminary round came from Skye who cruised it 9-0 at Taynuilt. Fraser MacKintosh put Newtonmore in the driving seat against Lochaber in the first half and scored another early in the second before Neil Stewart put the tie beyond the reach of the Spean Bridge side. Inverness manager Drew MacNeil returned to his old stamping ground at Blairbeg Park, having led Glenurquhart to MacAulay Cup success in 2012. Glen took the lead through Andrew Corrigan and Lewis MacLennan made it 2-0 before half time, with Neale Reid completing the job soon after the restart. Both Newtonmore and Glenurquhart must now wait for the outcome of the other quarter-finals on 26 April and 2 May to find out who their next opponents will be. Oban Celtic's 3-0 victory at Ballachulish in the GCC Celtic Society Cup was matched by the 4-2 success of their local rivals and semi-final opponents Oban Camanachd over a Bute side which has been taken to extra-time on three consecutive Saturdays. 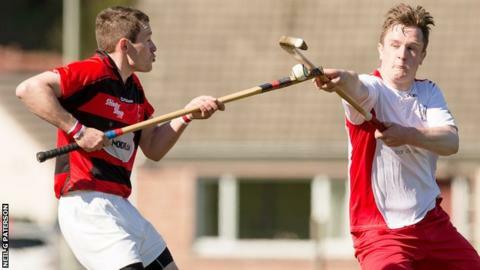 Lee Askew got a double for Celtic while Camanachd's Andrew McCuish matched that feat in extra-time. In the other half of the draw a Grant Griffin hat-trick in just 10 minutes helped Inveraray to oust Aberdour 6-0 in Fife while Kyles ran riot in Glasgow with a 9-0 thrashing of Mid Argyll which included four from Roddy MacDonald. Two weeks after succumbing 6-1 to them in the Premiership, Kingussie met Lovat again in the return match at The Dell but there was no goal rush this time after Kingussie's Louis Munro's early opener. Callum Cruden soon equalised but Savio Genini made the half time score 2-1 to Kingussie. The second half had barely begun when Greg Matheson pulled Lovat back into it for a second time. Lovat's point put them ahead of Kyles who have two games in hand. And Kingussie's took them off the bottom, above Oban Camanachd and also Fort William who went bottom on goal difference after their 3-0 defeat by Kinlochshiel. Gordie MacDonald in the first half and John MacRae and a Jordan Fraser penalty did the trick for Shiel. Skye's 9-0 Camanachd Cup rout of Taynuilt included a hat-trick from Jordan Murchison and the 1990 winners may well be regarded as favourites again away to Oban Celtic in the first round proper on 9 May. Liam MacDonald scored for Kilmallie with the last hit of the ball at Beauly to end the other tie at 2-2 and force a replay.